Where’s that calculator?… I’m sure it’s 14+ years now since I was first introduced to the wonderful rubber image blocks of wood back then. I loved what appeared on paper! Naturally, I signed up for a “beginner’s class” to learn all there was about rubber stamping. I had a great instructor, Catherine Allan (who writes monthly articles in the Scott Publications magazine “Scrap and Stamp” magazine as well as others). I love just about every technique there is to do with rubber stamping. 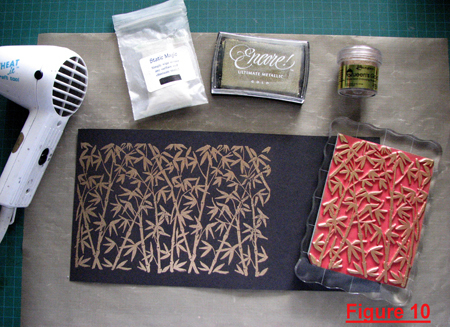 However, to choose just one technique it would be using my heat tool with good quality embossing powders. I love the ‘wow’ factor that appears on cardstock when I use my EP’s. Cranes, herons, geishas, cherry blossoms, dragonflies to name a few. My favorite stamping accessory is my Teflon Bone Folder. I won’t leave home without it. 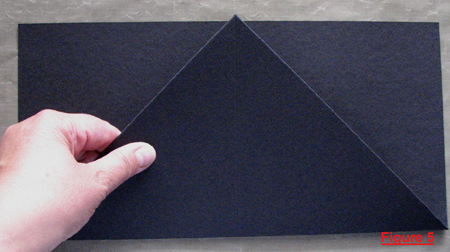 It never leaves a shiny mark on cardstock and is more flexible than regular bone folders. It’s heat resistant, and glues or inks will not adhere to it. I thought it was blue, but after joining OSA it has increased to three favorite colors now – black, red, and gold. I have many favorite embellishments but to name just one is difficult. If I must, then it would have to be ribbon or fibers. What was that old TV series called starring Richard Boone? “Have Gun – Will Travel”? Invariably, that would be my heat gun. It’s a well used tool from heating embossing powders, to straightening strips of venetian blinds (for making bookmarks), to heating Pensacore foam (make an instant impression to use as a rubber stamp) and to seal or dry anything instantly! I have grown to appreciate Asian art more since joining OSA. Oriental themed stamping always gives me the feeling of peace and tranquility when I complete a project. Although it can reflect boldness, especially with dragons, I find a more calming effect presents itself to me, especially when I use birds or floral stamp images. I wish I could visit every “Chinatown” in every major city or visit Japan to find Asian art elements. Can you imagine? Paper, tools, trinkets? Perhaps unusual stamping accessories? I have joined a few stamping lists over the years, but found that OSA fills my needs, especially in rubber stamping. I am a current member of ‘Next Generation Stampers’ as well, a great place to learn all sorts of techniques. Vamp Stamp News. There are many others out there for the novice or experienced stampers, such as “Take Ten”, “Stamper’s Sampler”, “Just Cards”, “Scrap & Stamp”, “Rubber Stamp Madness”, just to name a few. Yes, I have been published twice in VSN – December 2008 issue and March 2009 issue. I love working with a variety of mixed media making unusual pieces either for attachments to cards or as standalone projects. I love creating projects using gels, acrylic paints, beads, hot glue, and wire. I’ve also dabbled with metals like pewter (dry embossing), and using my Cuttlebug embossing folders to make fanciful background cardstocks. I have also dabbled into photography, paper tole, watercolor and oil painting, embroidery on cards, and CDs. I’ve also created my own teabag folding tiles and unusual ways to fold them, as well as the traditional teabag folding. I also love making handmade journals and books. I love taking classes on new techniques or old ones, just to refresh ones skills. I love to learn about new products on the market, and of course to build up one’s inventory of supplies. When I see someone else’s artwork whether it be a painting, a card, or a published article or I experience a place that is so breath taking it inspires me to say “I can do it” and I will eventually give it a whirl. However, given a few liquid libations (a nice glass of red wine will do) at hand, one never knows what could develop on my canvas. None whatsoever….but in hindsight I wish I would have taken art classes back in high school or at college. Yes, a few things especially after frequenting the aisles at my local hardware store. I have used soffit screen to spray patterns onto cardstock. I have also used fine grit sandpaper (did you know they come in a variety of colors?) to use as mattes on a cards. I’ve also used polyester window screening material as a background, too. Oriental Stamp Art website for sure! Just look at all the galleries in there! Phenomenal place for inspiration! Just Google ‘rubber stamping blogspots” and you will find oodles of blog sites for inspiration as well. Splitcoast Stampers is another website with a wealth of information and inspiration. 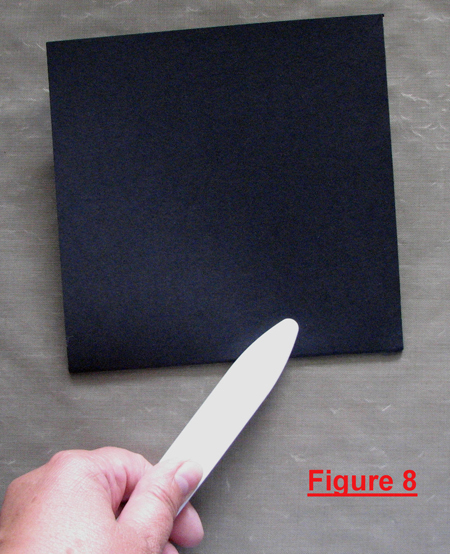 Score 1 sheet of black cardstock in places shown with dotted lines on Figure 1. 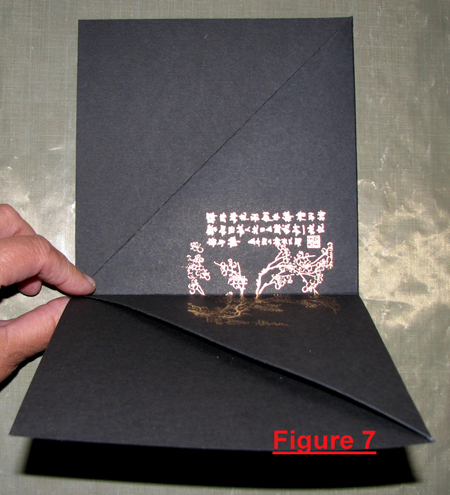 Fold the cardstock in half and crease well as shown on Figure 2. Unfold. 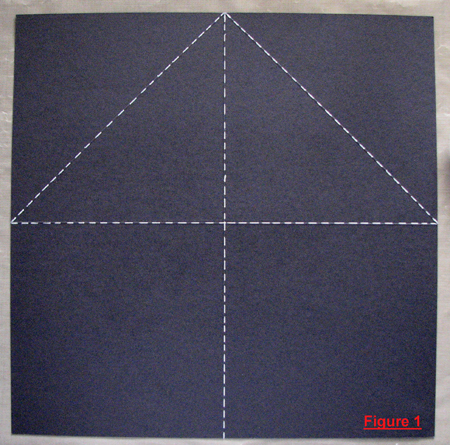 Fold both diagonal lines toward center and crease well as show in Figure 3 and Figure 4. 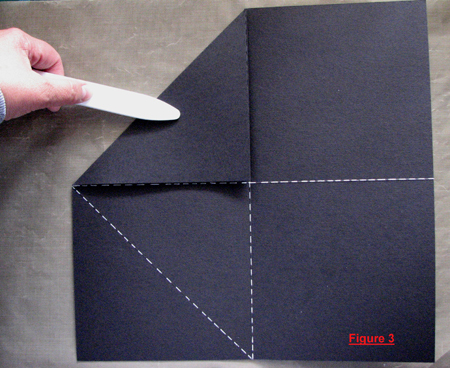 With the two diagonal folds tucked inward, fold these upward and crease well. See Figure 5. 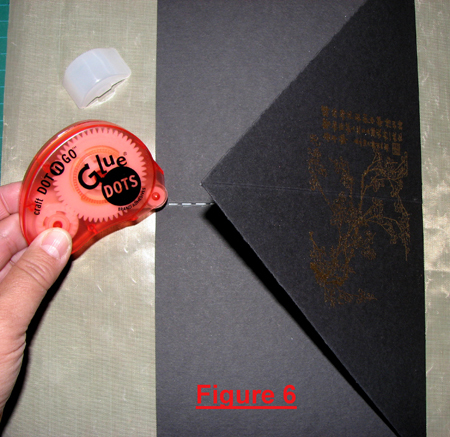 Apply one Dot‘N Go glue dot as indicated in Figure 6 below. 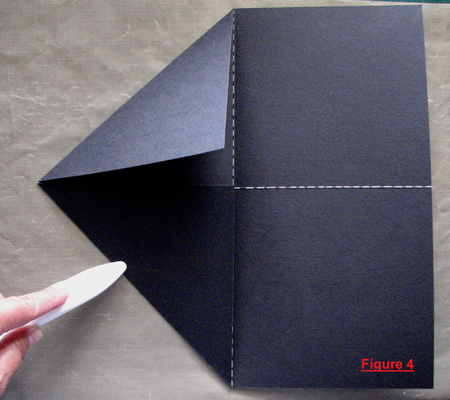 Continue folding over cardstock after applying your glue dot – Figure 7. 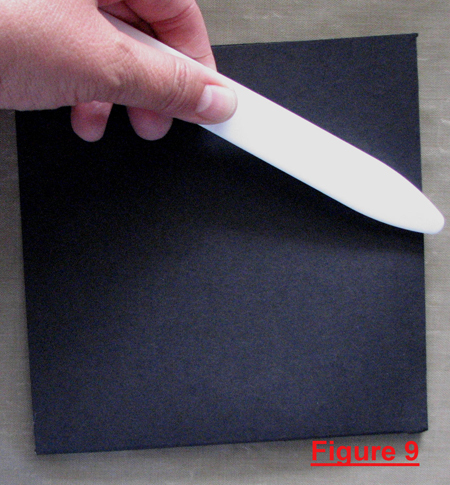 Firmly crease the two edges with your bone folder as shown in Figure 8 and Figure 9. 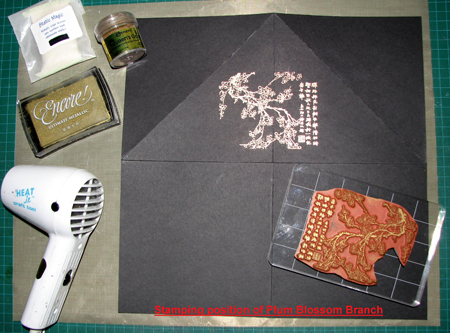 1 piece measuring 2” x 3 7/8” (to be stamped with the Japanese Tea House in Gold pigment ink and Queen’s Gold EP and heat set) See Step 15. 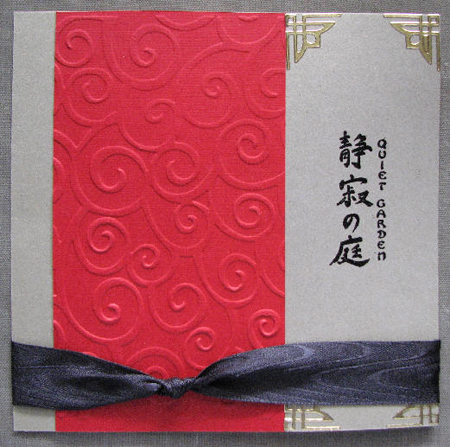 Assemble Brushed Gold cardstock matte with Red Embossed cardstock matte to front of card as shown in illustration below. Offset slightly. 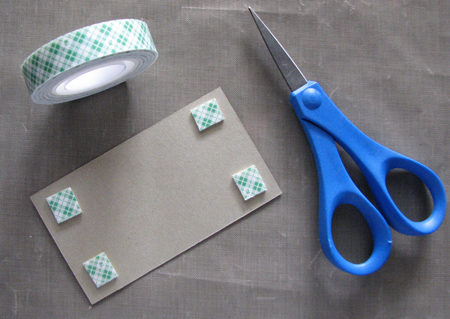 Glue or tape in place. Cut black satin ribbon and tie a offset knot to left end of ribbon. Adhere with tape on the reverse side of the Brushed Gold and Red Embossed cardstock matte. See image below. Optional: add Asian style gold corner peel-offs if you wish as shown in illustration. 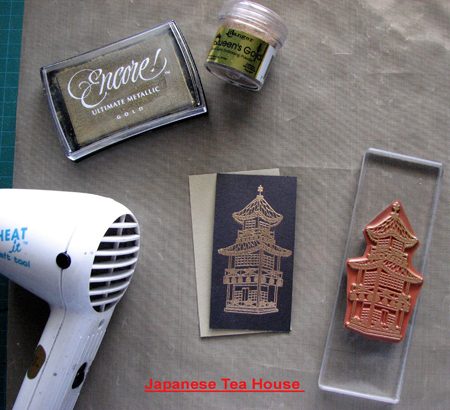 Assemble Black Cardstock with Japanese Tea House stamped in Gold pigment ink and Queen’s Gold EP, to the Brushed Gold cardstock, using as a matte. 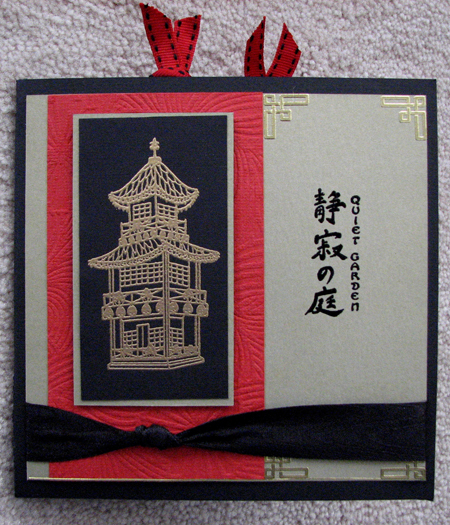 Adhere Step 11 item (Japanese Tea House) with foam tape, centered on red embossed cardstock between top edge of Brushed Gold matte and the black ribbon at lower part. 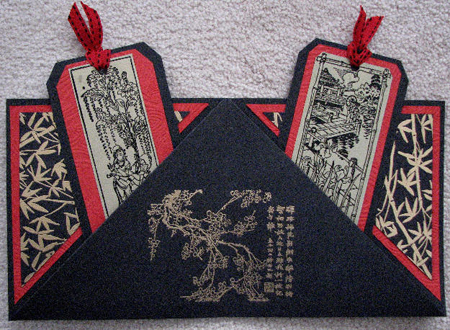 Assemble and glue Red Embossed triangular pieces of cardstocks and Black Gold Embossed Bamboo backgrounds to each triangle shape. Then adhere with glue or tape to the inside corner areas (upper left and upper right). 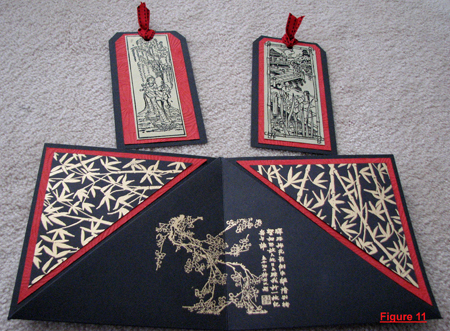 Assemble and glue Red Embossed cardstock matte to front of each Black Tag. Trim the Brushed Gold rubber stamped image pieces (Tranquility Garden and Heavenly Musicians) to fit each tag appropriately. Punch a ¼” hole into top of each tag, and thread the red black stitched gross gain ribbon through each tag and knot. See Figure 11 below. 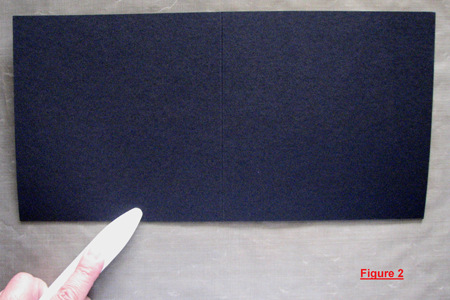 Tuck completed tags into the 2 pockets of the card.